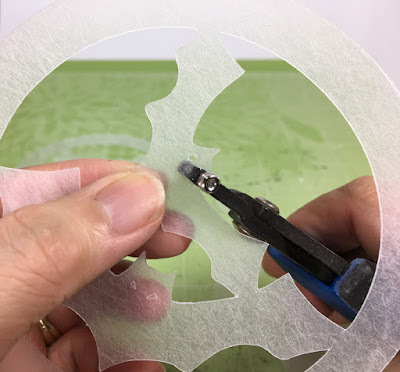 Die cutters like the Sizzix are useful for jewelry making - see this past tutorial of mine on how to make denim earrings where I put my Sizzix to use. But I wanted to do much, much more and not be limited by the dies available. 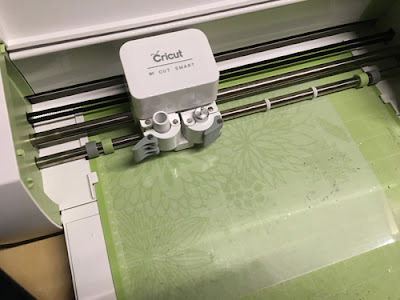 So I did some research and decided on and bought my Cricut Explore (they now have newer models which are currently on sale). The Cricut machines could cut not just the typical paper and cardstock but fabric, leather, suede and so much more. 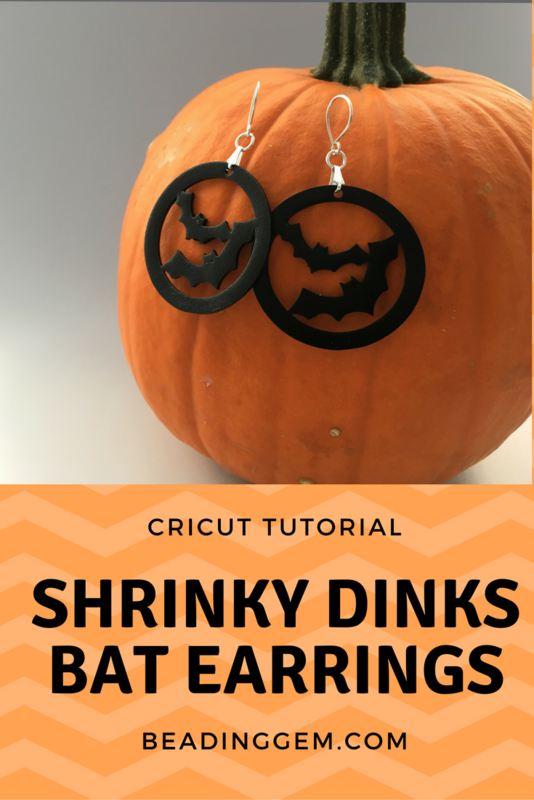 Since Halloween is just round the corner, I made some Shrinky Dinks bat earrings to wear. 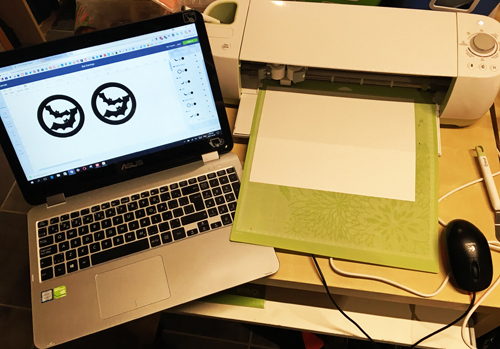 This tutorial shows you how to design and make them on the Cricut. It is an easy project to learn the basics as well as how this machine works. This is just the beginning. 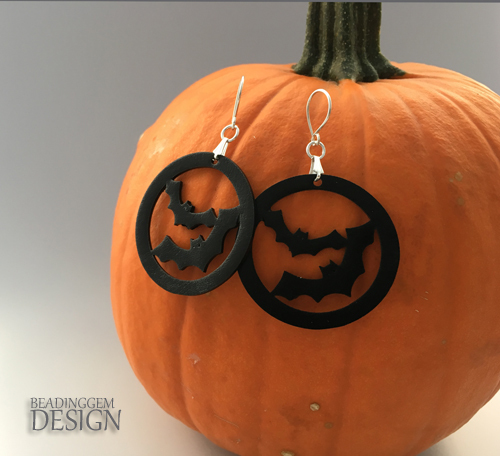 You can do more than just Halloween designs! Expand from jewelry to home decor like snowflake ornaments and so on. 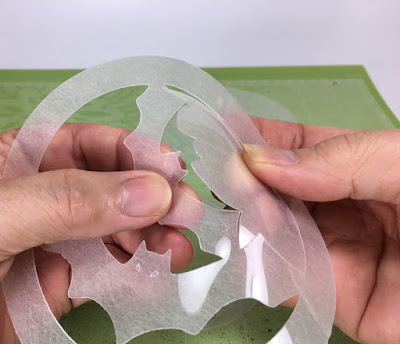 If you are a beginner and want to tackle different materials like leather, I recommend Lia Griffith's Craftsy Craft and Create with the Cricut class. There are other classes there which will also interest crafters and if you are creative, apply the techniques to jewelry making. But I found the Cricut to be very easy to use. The instructions are simple and few! 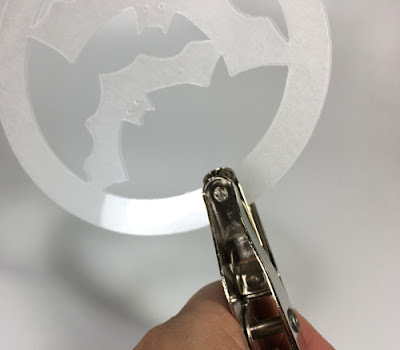 You can either use Cricut images (for a small fee) - they have a large library - or upload your own. What I did was create my own silhouette image. 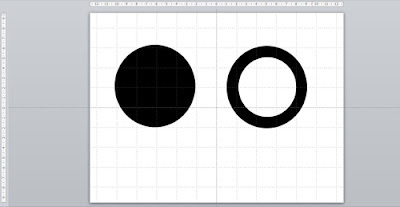 First I created the ring in Powerpoint which is simply a small white circle laid over a bigger black circle. Then saved it as a jPEG image. Circut's Design Space is easy to use. When my ring image was uploaded, I was prompted to choose the kind of image it is. As it is just a silhouette I wanted, I chose "simple". This is where I really like the software. Making the background irrelevant is as simple as clicking inside the ring and outside. Doing this step in Adobe photoshop or illustrator (which most of us cannot afford anyway) is not as straightforward. 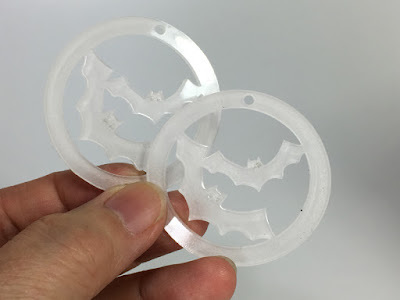 I found a free bat image in Google search and uploaded it as well. After inserting the images into the Design Space, it was on to designing. You can easily copy the image, rotate it or make a mirror image. Once happy with the design, I grouped all the elements so they can be moved and resized in unison. Remember that shrinky dinks reduce to very approximately 1/3 the size when heated. 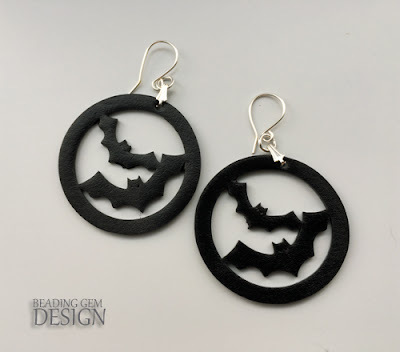 So using the grid as a guide, I resized the image to 3 x (about 4.5 inches) what I wanted the earrings to be. The final earrings were 1.75 inches across. 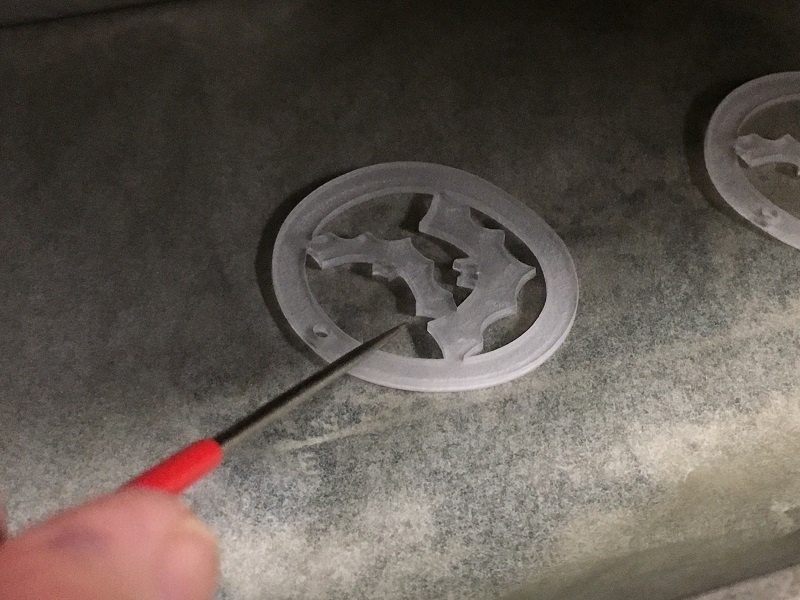 Also important is to "weld" the image, which in Cricut terms is like an additional bonding step. It ensures that the elements will be cut in the right position. The preparing the mat step below shows that I did weld the image properly. If the bats were floating outside the rings, then they are unwelded. 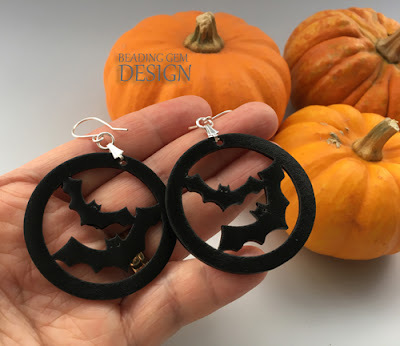 Here is the final bat image for you if you wish to make your own bat earrings. Just do a screen capture and save it on your computer. Moving on to cutting. 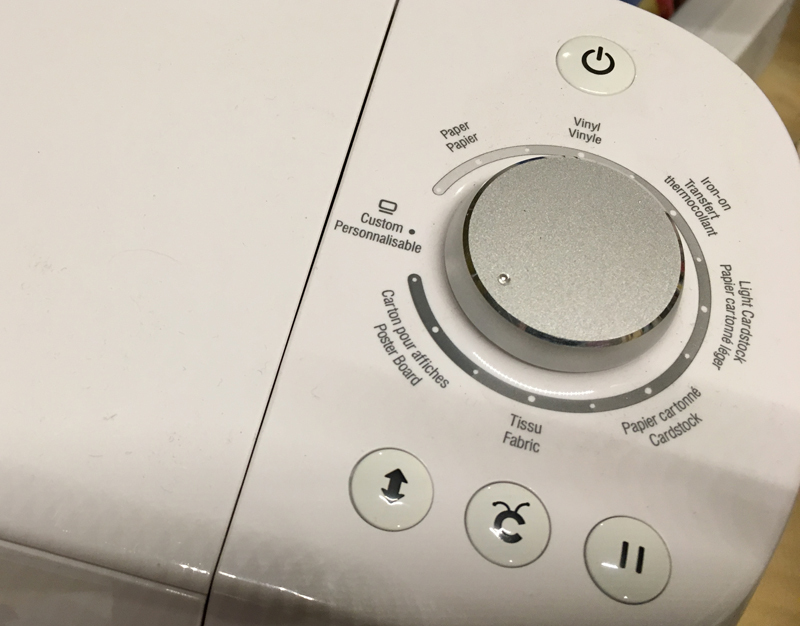 The dial shows the different settings which will be applied for set materials. There is a customizable button which has a list of possibilities in the software. I chose to just use the Posterboard setting and changed the blade to deep cut. The deep cut blade is worth getting because it is the one you will use for leather and thicker materials. Note that you have to have the right blade housing for your machine. The cut pressure was fine as it was. I did change it to just a single cut (the number of times the blade goes over the lines) as I wasn't working with leather or fabric. The standard grip mat was fine too for the shrinky dinks sheet. 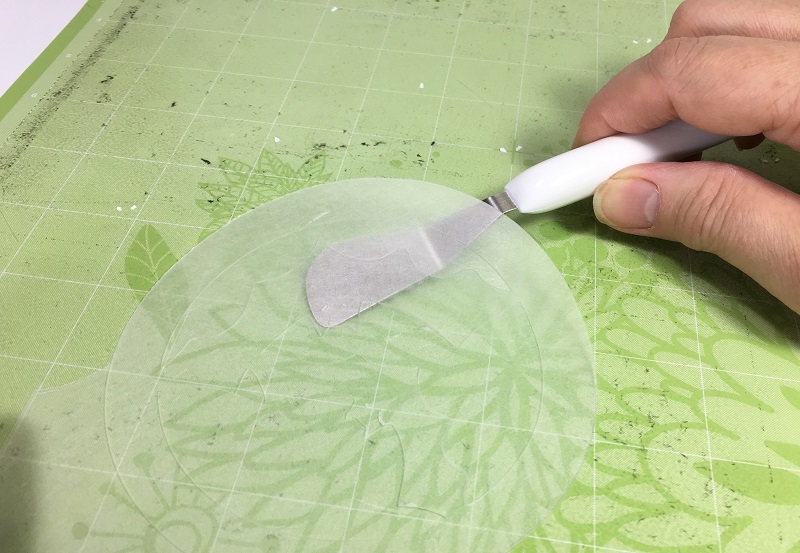 If you were cutting leather, you will need the strong grip mat. I stuck the smooth side of the plastic sheet down for better contact. It was fun watching the machine do the cutting! Once done, carefully lift the cut design off the mat. 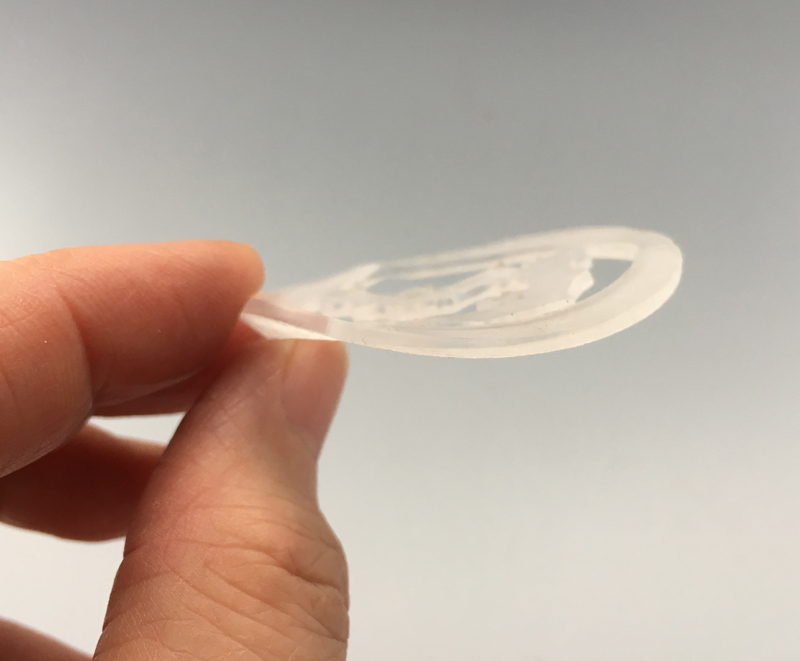 The plastic is stiff and can tear at the corners if you are too rough. Then gently bend the design and peel off the unwanted sections. The original bat image had triangle eyes which were not well cut because of how tiny they were. I just enlarged these with my Europunch round hole punch pliers (1.25 mm) which is usually used on metal! Note that when the bat design is shrunk down, these eyes will barely be noticeable. I put both earring designs together and used an ordinary single hole paper punch to create the hole for hanging the ear wire. The following tips on shrinking the plastic should help you avoid this misshaped result. Always line the baking tray you are using in oven with parchment paper. 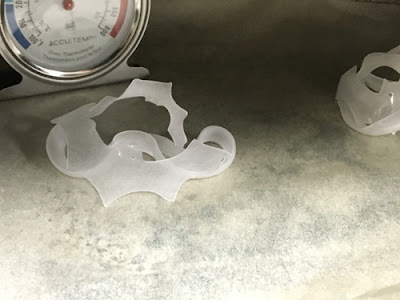 The plastic could accidentally stick to the tray in spots. The ring based design means it is all to easy for the plastic to fold over in awkward shape and NOT flatten out properly. Don't try to lift the pieces from the baking tray. You risk losing the shape. I just placed a white ceramic tile (I use it for polymer clay work) upside down on the pieces I turned off my toaster oven and let everything cool down. I can't find the colored shrinky dinks sheets anymore. No matter, the frosted sheets I have are fine. Just needs another step. 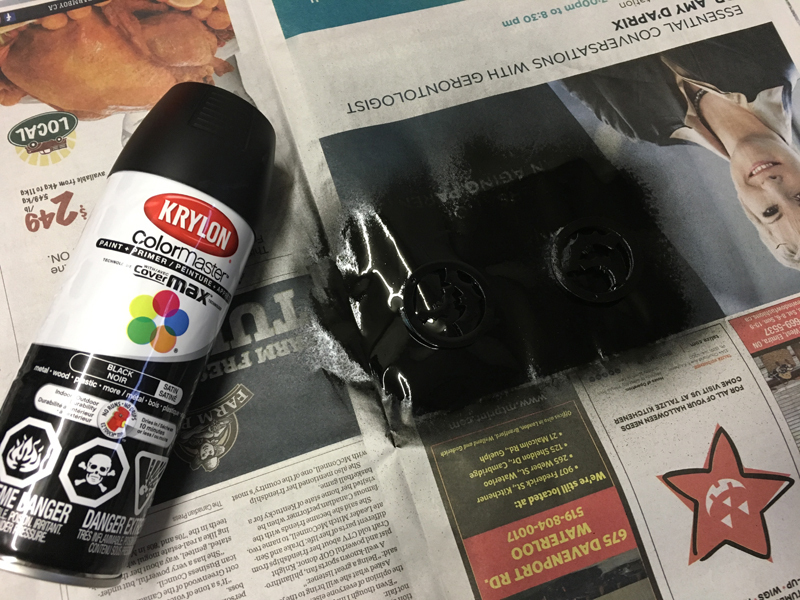 2 spray layers of Krylon Colormaster in matte black (works well for plastic too) did the trick. I placed the pieces on some blue tack. You could use round felt furniture protectors etc - anything to raise the pieces so they do not stick to the newspaper. Note : I sprayed on the frosted side which helps the paint stick better. There is no need to do the other side. Once dried, the earrings can be worn with the smooth side or the matte side facing forwards. I added my favorite earring findings and viola! Happy Thanksgiving to you too Pearl. I hope you are enjoying your long weekend but knowing you - you're probably as busy as a bee. I've always looked at the Cricut machine and passed it by. Partly because I'm always wondering where I would put another large tool in my studio but mostly because I haven't allowed my mind to wander the possibilities a Cricut offers. Your earring findings...is that a pinch bail you used first before the jump and hook? If so... interesting! Hope you are enjoying your Thanksgiving! Yes, it is a pinch bail - I love using them instead of a jump ring for earrings. A more polished look to me.